This Narali Bhat recipe is a simple recipe made with coconut, jaggery and rice, garnished with cashew nuts, raisins, saffron and almonds. 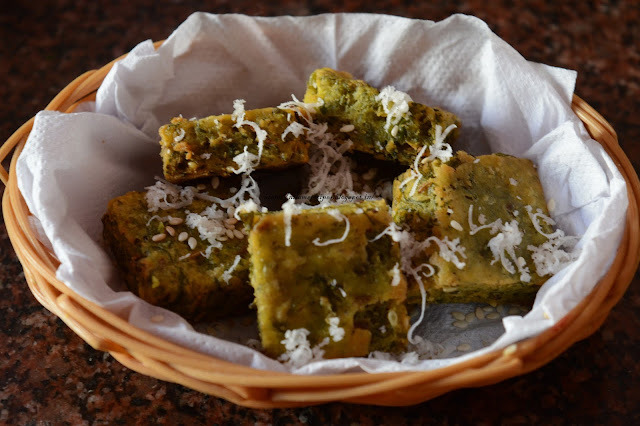 This traditional Maharashtrian recipe is very filling, fragrant and tasty. This rice specially makes on Narali Purnima in most of the maharashtrian families.Coconut has numerous benefits for skin, hair and health, making this coconut rice a very healthy recipe. This Coconut Rice recipe is fit for childrens as well as the elderly. This rice dish has the nutty flavor and amazing texture coconut brings along. The crunchy nuts added to this dish is the icing on the cake. Wash and drain rice. Keep aside for 30 minutes. Heat 2 tsp ghee into a pan. Add clove and fry it. Add washed rice and sauté for 2-3 minutes on medium low heat. In-between boil 2 cup water. Add hot water on rice. Cover and cook the rice. Once rice is cooked spread it to cool down. Mix the coconut and jaggery in a bowl. Add rice to coconut and jiggery mixture. Mix very gently. Heat a deep heavy bottom pan. Add ghee to it. Fry cashew nuts and raisins. Remove from ghee and keep aside. Turn the heat to low medium add coconut jiggery and rice mixture. Also add cardamom powder. Stir occasionally. Cook the rice uncovered during last few minutes. Once rice become dry add fried cashew nuts and raisins. Add saffron, little ghee and almonds slices while serving during last few minutes. 1) Wash and drain rice. Keep aside for 30 minutes. 2) Heat 2 tsp ghee into a pan. Add clove and fry it. 3) Add washed rice and sauté for 2-3 minutes on medium low heat.In-between boil 2 cup water. 4) Add hot water on rice. Cover and cook the rice. Once rice is cooked spread it to cool down. 5) Mix the coconut and jaggery in a bowl. Add rice to coconut and jiggery mixture. Mix very gently. 6) Heat a deep heavy bottom pan. Add ghee to it. Fry cashew nuts and raisins. Remove from ghee and keep aside. 7) Turn the heat to low medium add coconut jiggery and rice mixture. Also add cardamom powder. 8) Cover with lid and cook for 15 minutes. 9) Stir occasionally. Cook the rice uncovered during last few minutes.Once rice become dry add fried cashew nuts and raisins. 10) Add saffron, little ghee and almonds slices while serving during last few minutes.